It was an early morning flight to Madrid so I had to get up at 3.30am with taxi pick up at 4am for the 6.30am flight. I also didn’t know the procedure with ONE plastic bag per person to fill with any liquids etc. Prescription items like water nasal spray doesn’t need to go into this but I was unaware that I needed the label on the item (I’d thrown away the box) so I argued with the “jobs worth” where they scanned your bags. He called his Senior over and I argued with him too. So I ended up throwing my shampoo and conditioner (short hair, don’t care) so that I could keep other “essential” items. Not a good start as I has specifically put everything in a smaller containers *eye roll. I tried to purchase a small bottle of body cream I use to try to stop itching and had to buy a big tube knowing I would have to throw it away for the return journey to fit everything into my “small sealed plastic bag” (it HAS to seal, that’s the law…) oh well. I found some granola and yoghurt to buy over the greasy bacon and egg butties and a pint and stood to eat it before walking to the gate ready for boarding. One of my Oncologists previous consultant Dr C who worked with Dr G was in the pharmacy que and I only realised it was her after I had walked past to join the end of the loooooong que. I walked to the gate and saw the Radiotherapist who arranged my neck radiotherapy (he didn’t recognise me of course). On the flight and I was in the cheap seats (middle one on RyanAir) found my seat and said excuse me to get past the person on the end row seat so I could get into my seat. The chap was not impressed when I then asked to get up again to get something out of my hand luggage just as I had sat down. Near the end of the flight before the signs came up and everyone dashed to the loo I had to wake said “miserable professional” next to me to get out as he had slept all the way on he plane. As you guessed he wasn’t happy and grunted and never smiled as I said a bright and breezy “thank you!” As I got out of my seat. (He was also going to ESMO17, he was reading some ESMO documents, so I’m expecting he’ll probably haunt me there as I will keep seeing him). I stood waiting for the toilet to be free I could see this chap in front of me and he looked very pale and before I could even say “are you ok” he kind of sat down on the floor as his legs just gave way and fainted! I waved for an attendant to come and the chap in a seat nearby pressed the buzzer – there were enough medical staff on board to sort him out – anyway they got him up and sat him with his head between his legs. He looked very pale like a cancer patient…. maybe not. I hope he was OK as I didn’t see him at arrivals. Back to my seat and “grumpy” sat next to me then starts sneezing and blowing his nose… not what you need when still susceptible to colds and coughs with a weakened immune system. I always seem to manage to sit next to the “ill ones”. Flight landed and I arranged a taxi to pick me up to take me to the IFMEA conference centre where ESMO17 was taking place. It’s a huge event and of course to accommodate just over 24,000 people then it’s got to be quite a big place. I had an app for the conference which was great to see what sessions to add into your diary but it didn’t accommodate for posters and so all the 133 sessions I had added into the diary app had a bit of a fit as it tried to schedule all these into my computer. So I opted to go back to paper and pen and highlight them and then when I got there using the printed small book which provides a great reference and to find out times, rooms and places as you flit from session to session sometimes only picking out one talk in a session of say 4 or 5 on a topic. You can’t knock old style pen and paper. I try to involve other sesions to attend and learn about not just breast cancer so the big one this year, like last year, was immunotherapy. 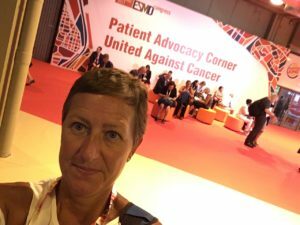 The ESMO patient advocacy track is fantastic as along side the indepth research and information sessions about new and upcoming drugs you have the patient advocacy track which doesn’t just include patients. 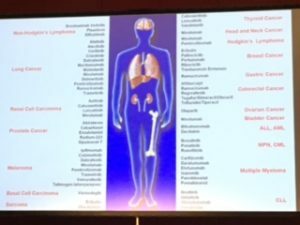 There are industry pharma people and health professionals who attend – it’s a must for others to attend as patients are at the center of everything they do, so if you want to learn anything about these drugs or psycho social aspects about the disease or patient advocacy, then head to the patient track room! Everyone should use this resource and LEARN from the patients themselves. It is brilliant. CDK4 inhibitors – in UK the drug Pablociclib is only available 1st line for metastatic disease via Pfizer as a FOC offer for a limited period – in the uk we don’t have access currently apart from on this one offer – is Europe under the same pricing restriction as uk – given that Pfizer have already made over £2 billion on this one drug is the current price of £140 per pill justified? QOL matters and if it’s not guaranteed, I’d like to see more post treatment support for long term side effects – my teeth are crumbling one by one now. Blocking adrenaline as implicated in spread? Who do docs refer patients to right after diagnosis for support? What groups/organizations? How do docs know who to send patients to? From a patient perspective they all matter (firstly QOL!) – why distinguish between side effects that ‘matter’ in reference to severity they all impact. 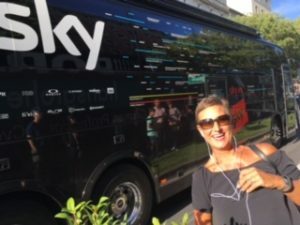 When is oncotypeDX (or similar) going to be a standard in the UK? Will the biosilimar Herceptin be exactly the same as the standard Herceptin? Immunotherapy – any positive results for this in TNBC and what is the reason that this won’t work in other breast cancers? Blood biopsies – does anyone know when his will be a standard test for any mets patients? It would be good for the patient and cost saving (and quicker) to be able to have blood tests to identify recurrence or progression instead of scans. I attended some sessions on breast cancer and on the patient advocacy track for the first day. 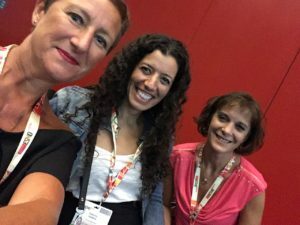 It is a great way to meet other patients too and also the sessions are extremely interesting to industry and clinicians alike – people want to know from a patient perspective. I met up with Dan and his colleagues from VJ Oncology in the evening for a meal which was fun. I felt it was like a little family getting back together after a year. I had made some really nice friends from last year and it was great to catch up with them and have a good laugh. We went out for tapas that night local to where they were staying right in the heart of the Spanish community. It’s amazing how the bars and restaurants come to life after 10pm. Always a great family affair with everyone spending time around the table eating and drinking (and the kids still do the same as everywhere else glued on social media or games). I left at a decent time this year (no “Chris” dancing this time). Patients were quite surprised at their inability to understand the situation we are in. Nothing suprises me any more. I think there is a lot of lip service with patient involvement and this just confirms this for me. 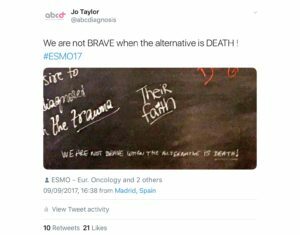 Get this – Many patients don’t actually like being called brave – yes seriously. 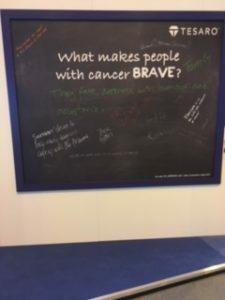 What makes people with cancer BRAVE? SATURDAY: Was a long day with talks and presentations from 9am till 7pm. 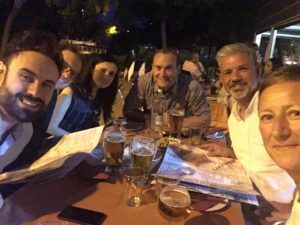 I met Teresa from Patient Power back at our hotel and we went for some dinner at a Spanish restaurant behind our hotel. We were right next to a huge shopping centre and I didn’t place one foot into any shop whatsover (really!). We had a lovely meal and caught up with what was happening in our lives and able to have an early night as my feet were killing me. Not great to have peripheral neuropathy in your feet when you have 5 days of walking around at a conference. Flip flops were the footwear of choice with the hot weather! 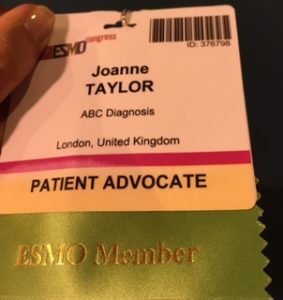 As I am a patient advocate I have full ESMO membership for the year. 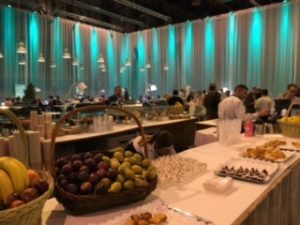 This meant for this conference, the main plus point was that I could attend the ESMO Members Lounge where you could call at any point through the day when it was open for refreshments so drinks and food. They would provide sandwiches at lunch time and a hot buffet. There was also a great space for sitting, working or networking and a great place to just meet people. This also saved lots of money as last year I know the first day at ESMO16 I paid something ridiculous like the equivalent of £5 for bottle of water! (they do have apples and water for free walking around). 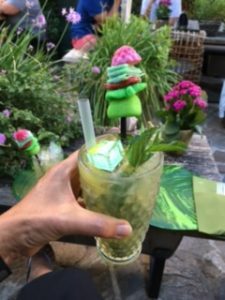 Food and drink isn’t included in the ESMO grant but flights and accommodation are, aswell as getting to and from the airport but obviously not other journeys back and forth to the hotel. You also get a 5 day pass to use on any public transport so that was really helpful if you wanted to venture out and see the city if you have an underground stop nearby. SUNDAY: Next days diary was full from session to session you go, trying to absorb, learn and tweet at the same time is quite mentally challenging. I attended one session for metastatic breast cancer talking about the research posters they had created and it was pretty much over my head. I came out of the session early as there was no point in even attempting to tweet information. If I can’t understand it somewhat, then patients probably won’t be able to. So off to the ESMO lounge I went. I had a tweet from a breast cancer friend in Ireland (Eileen) who told me someone she knows was there and it would be good to meet up. I messaged Dr B and we arranged to meet in the lounge. We got on like the proverbial house on fire from the start with the same SOH. We discussed many issues about cancer from patient perspective and had the “craic” straight away (he’s from Ireland). Time ran away with us and I wanted to attend another session which had already started so I had to leave. 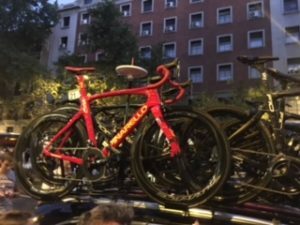 We got in touch later around 4.30pm and Dr B wanted to see a bit of Madrid and I asked if he would want to come to see La Vuelta with me which I knew was finishing in Madrid that evening. Cycling wasn’t his thing but he thought it would be good to go and see and Dr B guiding on Google with directions after I asked one of the conference helpers. 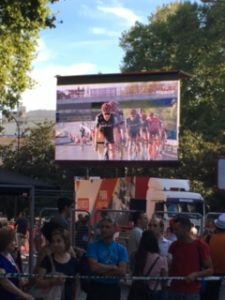 So we got to the tube stop and had a little walk into Madrid centre and RIGHT into the centre of the La Vuelta tour buses and action going on with the bike ride! 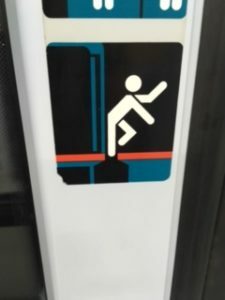 Mind your bum when the doors close or maybe no weird dancing on the tube? We tried to get out the next stop and our ticket wouldn’t let us (we must have been out of a zone), we had to go to the next stop as we had also no internet connection to look on maps to see if there were places to eat. So next stop we surfaced to a huge football stadium in a lonely residential area with what looked like fields around. “Ah google says there is somewhere to eat about 12 mins away” he said, so we headed in that direction thinking we would get to a small town on the edge of Madrid. Nothing, one bar closing down, no taxis driving past, no people apart from two talking with the bar owner who was closing. So I said I’ll ask them and they both spoke little English. Ah now stuck, so taxi? “Can you ring a taxi” with all the gestures for ring and taxi as I could explain with hands. They passed me their phone and asked me to type what I wanted in and they would translate from English to Spanish.. so I put in “where is the nearest town or place to eat and to get a taxi?” So they rang a taxi but no reply, it was obvious by this time on a Sunday night that there wasn’t much going on. So the chap said in broken English “we are going but we have a car and can drop you near a taxi rank” I looked at Dr B, so nervously and thanking them we said yes. I could have eaten a scabby horse I was SO hungry so off we went making this into a weird unexplainable adventure. Muttering to Dr B “OMG I cant believe this, you’ve got us lost and now were getting into a strangers car? 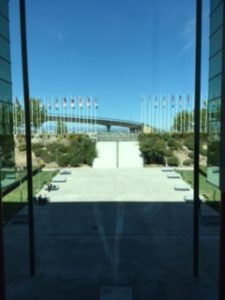 !” He rolled his eyes “me?” We got in the car and they took us to the drop off point and the Spanish lady had ordered a taxi saying it will be here in 8-10 mins. We were very thankful but we were still in the middle of nowhere at the side of the road. So 10 mins passed and we kinda guessed this taxi wasn’t going to pick us up. My UBER app wasn’t working (this was one of the problems!) So Dr B said he’d downloaded the app just never used it so logged on. “it wants my passport details!” – head slap time as I’m thinking were not going anywhere now. “I have my passport!! !” he shouted. YES! Thankfully he just had to log those details and credit card before you can order the taxi! Details inputted he ordered the UBER taxi and we tracked the car as it came nearer to collect us. It collected us and we decided it was too late for food and to head back to respective hotels. Our hotels were in opposite directions so we dropped him first and then I went to my hotel. I arrived in about midnight and bought a packet of Dorritos, rice cakes and biscuits from the vending machine as I had had no food! Up at the room and the curse again wouldn’t let me in the electronic door so made my way back down for the electronic swipe key to be validated. Home… it was an extraordinary night! I messaged Dr B as he wanted to know I was safe and not been chopped up and put in the boot of the car! (vivid Irish imagination). Well that was a bit of an adventure with someone who I had only met 5 hours previous, lost in Madrid and being offered a lift by Spanish strangers (children don’t EVER get in a car with strangers!) We exchanged some funny DMs. One very unforgettable evening! And from the moment we met we joked about I should write a book of various things that came up in our conversations and “two get lost in Madrid” will have to be one. Sequel “two get lost in Germany” ESMO18 ? MONDAY: Was an easier day as most of the sessions were coming to an end and the conference was finishing that day. I had a meeting with another tweeter Chris Curtis from the Swallows Group (head and neck cancer) to discuss patient issues around involvement as we had met in one of the first meetings on the first day. We had an interesting discussion and I am hoping that 2018 we can possibly work together on a project. After talking to many other patients in the past few months after ESMO17 they also expressed an interest of involvement in this new venture. Watch this space. I attended the sessions on the Monday and was finally done at 4pm. My flight was the next morning and laughing (never again scenario) I messaged Dr B and asked what he was up to. He was finishing at a session and said he’d pop over to see me. And the words “are you doing anything for dinner?” came out of my mouth. So off we went back into Madrid center on the underground and wandering around in the 33 deg heat at 7pm at night I had an idea. What about a roof top bar? 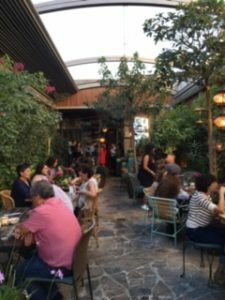 Even better after a quick google there was a roof top bar and restaurant 5 minutes walk away The Secret Garden – Jardin de SB. We arrived at the destination – a luggage shop – to find this garden oasis up 4 flights of stairs (there is a lift for those unable to walk up). It was beautiful. There were mist sprayers near where the roof would be for the plants that they had vertically hung down the walls creating a wall of greenery. The sprays obviously helped keep the plants watered and also provided a nice cooling spray to cool customers down on a hot night. We ordered food and a couple of amazing cocktails with huge sweets on the stirrer which you were able to eat. The only place available was on a swing seat with a table in front which very quirky but not that great for eating on but we managed. We hadn’t been served with the meal yet and after much talking suddenly the conversation kind of stopped. I looked at Dr B and I could see he didn’t seem right “are you ok?” I asked and he just mumbled “I don’t feel right” and sort of slid a little down his seat! I could see the perspiration on his forehead and he was kind of a bit white/grey (more so than the usual Irish complexion) so I quickly asked “are you diabetic?” I didn’t know him and it’s not something that I guess you share with people who you’ve only met a day prior “no” he replied and I stood and shouted the waitress over as he said he needed some water. He sat in the chair looking like he was going to faint and they came rushing over. I asked if he needed to lie down and he said he was fine, started drinking the water. For what seemed like forever he finally came round. It seemed like the heat and possibly not drinking enough fluids had made him feel not very well and he had felt faint. 15 minutes later he was his perky chatty self again. Glad it was the last day as I’d be worried to go out with Dr B again… strange things happen! We finished our meal and I decided to get a taxi back to my hotel instead of risking the chance of getting “lost in Madrid” again on the underground. My flight the next day was mid morning so I was up and out for an early taxi to the airport. Sat waiting to board the flight who should arrive but Dr B! He was with another advocate Kay Curtin for melanoma who had been at ESMO17 so was nice to meet her and have a chat about the conference. Another goodbye and we both went to board our respective flights home. I had a few nice evenings out but as you can see this isn’t a “holiday” – which is what most people think. 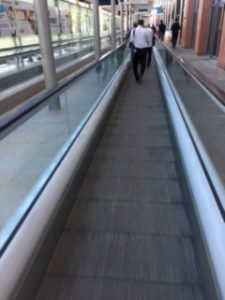 You fly off to a city that you may not even see as you are stuck all day at least 9-5pm (and longer) in a bubble of air conditioning with lights and 24,000 other people all walking from one session to the next doing the same thing. It is hard work, and its tiring especially for a patient. But I always find the conferences useful and informative and its great to network and meet other people professionals and patients alike. 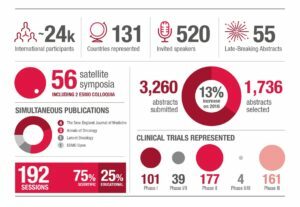 I had tweeted so much about every breast cancer session that the best thing to do is to provide the highlights that ESMO17 provide so I hope this is useful information and look forward to ESMO2018! Hope to meet some new friends if I get to ESMO2018 and hopefully see some old friends too. Here’s to the next adventure? !